A more modern look and feel than brass, and less expense than st/steel. These flat aluminium plates, will look great around the modern contemporary office. Manufactured from a anodised aluminium with a satin silver finish, each plate is engraved and infilled with paint for a durable finish. To further enhance your nameplate why not add your logo (please note artwork will be sent for approval, prior to any production). Aluminium Door Signs can be supplied with 2 or 4 screws, self-adhesive or without any fixings. 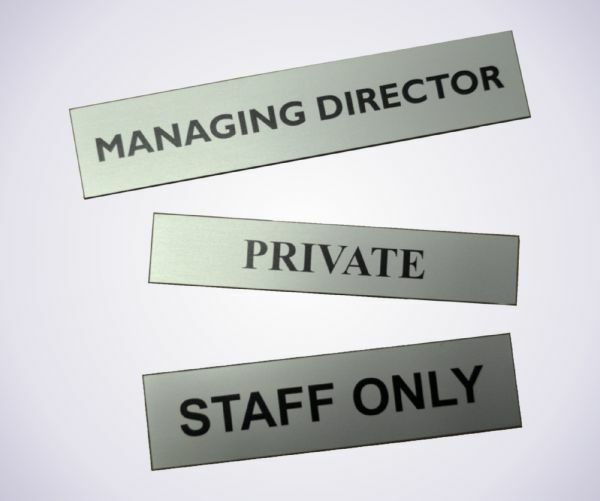 Our Aluminium Door Signs are supplied in a satin silver finish and anodized to an exterior grade. The material will not tarnish or rust and requires minimal maintenance.